Over Chuseok vacation, I headed to Ulleung Island, a destination I had been dreaming of visiting for quite some time. 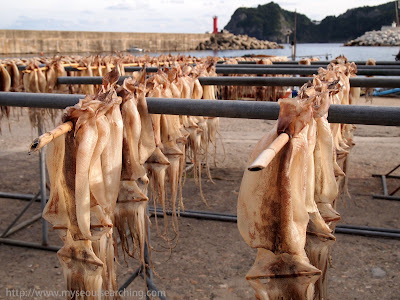 Situated in the East Sea (or the Sea of Japan to all of you living outside of Korea), Ulleungdo is an island that promises visitors spectacular scenery, tasty seafood, and a chance to relax far from the chaos of the mainland, which is what I was most looking forward to on this trip. 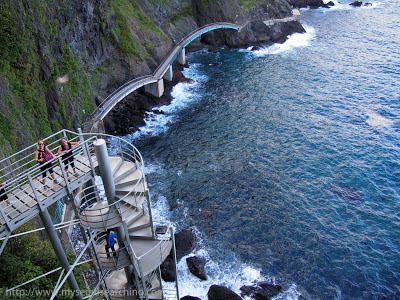 Ulleungdo is a bit of a journey from Seoul and requires detailed planning, especially during peak holiday seasons. I decided to leave the planning up to When In Korea (WinK), a travel company that caters to foreigners. I had traveled to Tongyeong with them last year and had been satisfied so I figured I would give them another go. Unfortunately, I wasn't as pleased. I met the group at Yanjae Station to find a number of buses ready to depart. There were many WinK groups going to various places around the country and no one seemed to know which bus was which. After a while of asking around, I finally found it: an old, small bus that required we cram in shoulder-to-shoulder in rows of four. We were late to head to Gangneung, which, due to holiday traffic, took about 4 hours. When we finally arrived, we were brought to the crummiest jimjjilbang I've ever seen. Very few of us were able to sleep at all before leaving a few hours later. To make matters worse, our guide's English was extremely poor and the group was confused as to how we were getting to the ferry terminal. (This would happen throughout the entirety of the trip.) When we finally made it to the ferry, we were not happy to hear that waters were rough due to a typhoon off the coast of the Philippines. After two and a half hours of listening to seasick people lose their breakfasts, we docked on Ulleungdo. Despite a rough start, things would get better for all of us on Korea's Island of Mystery. 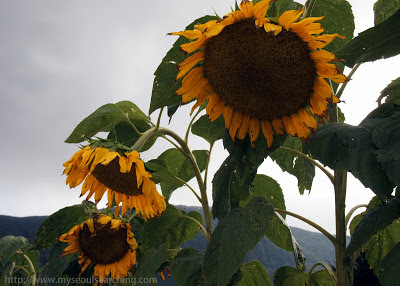 I spent three days and two nights in Ulleungdo with the WinK group. We covered a lot of ground and stayed busy the entire time we were there. So, rather than covering the entire journey, I'll share with you the highlights. Bongnae Waterfalls: There were a group of us who opted out of taking the optional trip to Dokdo, the island (which is, in actuality, a small cluster of rocks) that is the main source of sovereignty disputes between Korea and Japan. 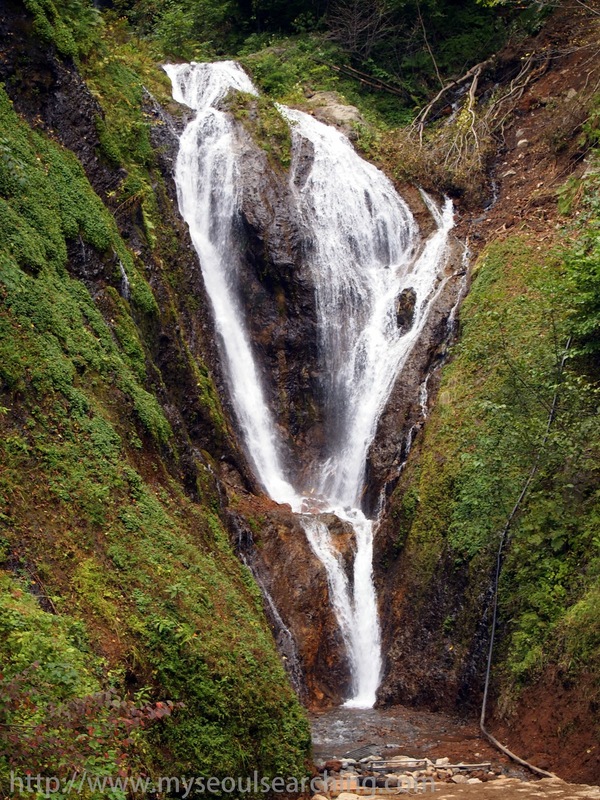 Later learning that the trip was a bust, we were happy to have trekked up to the Bongnae Waterfalls. As far as waterfalls go, they weren't that impressive, but the scenery was pleasant, and we admired the falls as we got to know one another. 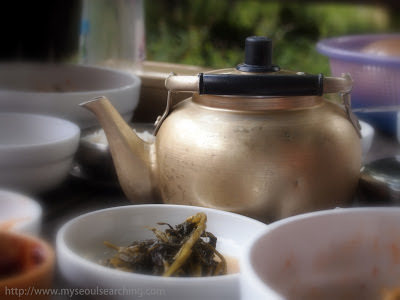 What made this part of the trip even better was the pumpkin makgeolli we shared near the falls. Ulleungdo is famous for pumpkins, one of the few vegetables that can be grown on the volcanic island, and locals find ways to incorporate it into everything, including makgeolli. The stuff was fantastic and addictive and Bongnae was the perfect place to try my first (but definitely not last) sip. Dokdo Observatory Cable Car: We arrived to the cable car (directions) later than expected. As daylight faded quickly, we worried that we wouldn't get the chance to see Dokdo, or anything for that matter. After waiting and complaining in a long line and practically giving up hope, we boarded the car. We were lifted up and over a tranquil Buddhist temple and greenery seemed to envelop the valley of which we passed. Just a few minutes later, we arrived at the observation deck and were escorted to an even higher platform that looked over the island. 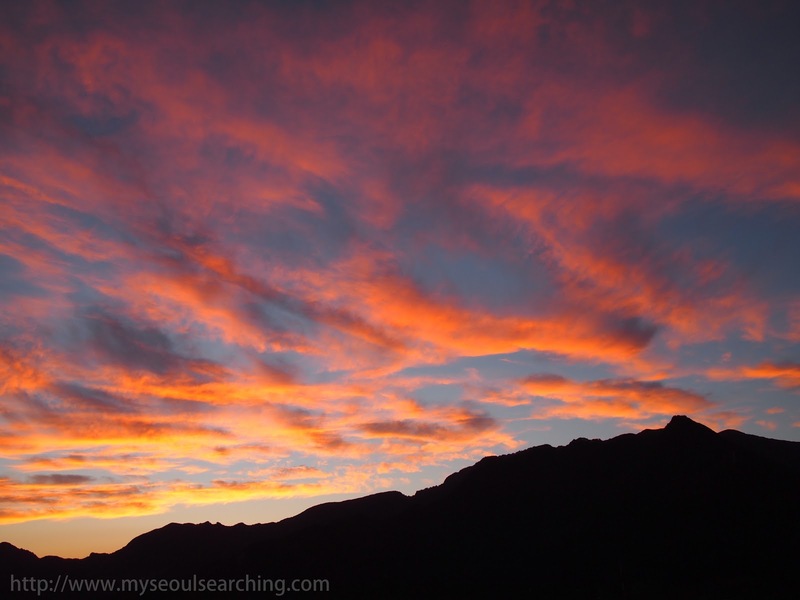 Cotton candy pinks and Creamsicle oranges painted the skies as far as we could see while a full Chuseok moon came into view. Darkness settled in and the lights of the famous Ulleungdo squid boats illuminated the horizon. A chill crept in and we sipped cheap cups of instant coffee as we gazed out from the top of the island. Suddenly, we had forgotten all about Dokdo. 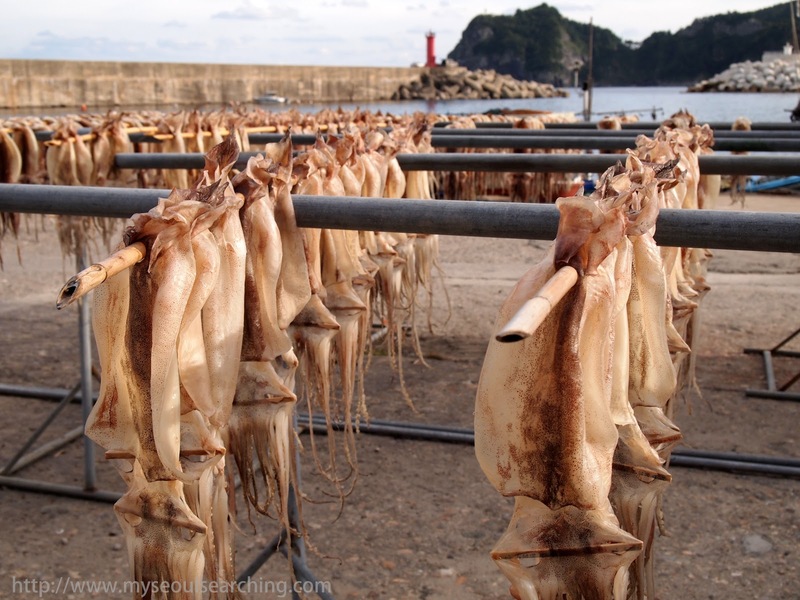 Squid, Squid, and more Squid: Ulleungdo is synonymus with squid. It's economic and cultural importance to the islanders can be noted everywhere, from the squid boats that line the harbors, to the rows of it hanging to dry on rooftops, to the bags of it available for purchase near the ferry boats. After getting high on the views from the observation deck, we packed into a small, family-run restaurant. 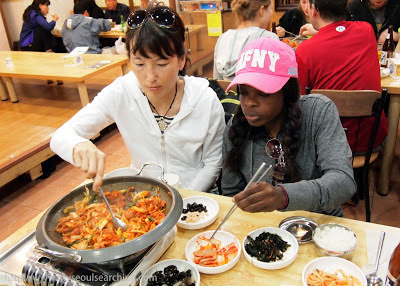 We ordered hot pots of spicy squid bulgogi, an interesting twist on the classic beef dish. I, personally, have yet to acquire a taste for the chewy seafood, but I did eat some of it and have to admit it wasn't bad. After dinner, we walked down to the fish market. 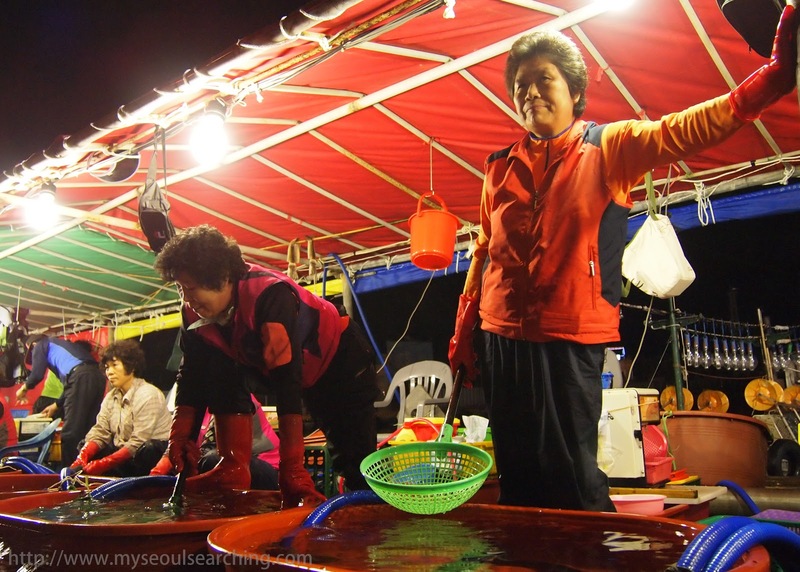 Even at 9PM, it was bustling with shoppers looking for a deal, ajumma pulling and cleaning squid as if it were an art form, and elderly couples snacking and sipping on soju near the boats. 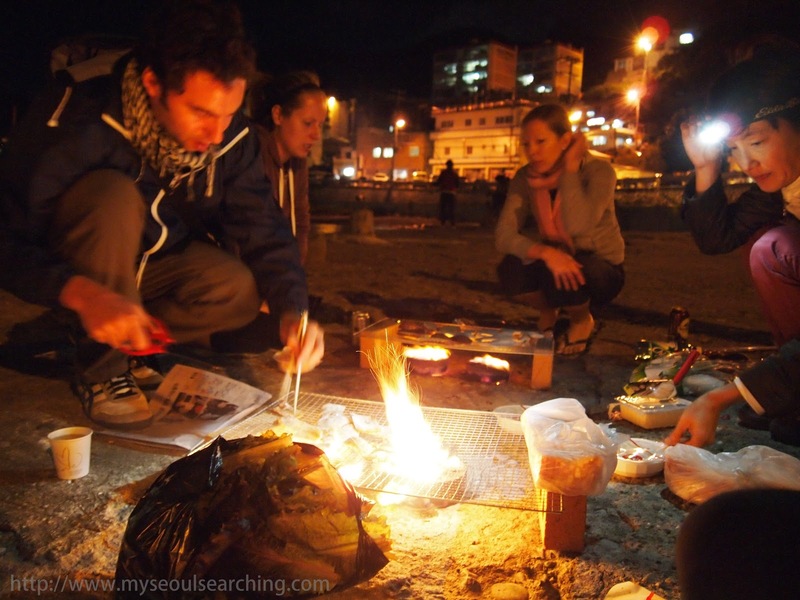 Picnic in the Nari Basin: The Nari (or Bunji) Basin (directions) is a volcanic depression that lies in the middle of Ulleungdo. Although the majority of the residents on the island earn a living in the fishing industry, those residing in the basin produce medicinal plants. The area was pretty and exuded a rustic vibe, surrounded by rolling hills and dotted with stalks of sunflowers. We visited the area for a picnic lunch of bibimbap that used only vegetables grown in the area. I did my part to drain the accompanying brass kettles of seed makgeolli. We split up after lunch and wandered the area, snapping photos of the flowers and visiting the tumakjip, traditional houses, that were open to visitors. There wasn't much to do in the Nari Basin, but it was a picturesque location for a good, outdoors lunch. Seaside Barbeque: During our trip, we stayed in a small guesthouse located near the main port, where many of the tourist accommodations are. Just downstairs from our rooms was a jetty that stuck out into the port, the perfect place for a seaside barbeque. Our guide and a few others on the tour headed out to the market and stocked up on veggies, rice, ssamjang (a bean/chili paste for lettuce wraps), and fatty slices of samgyeopsal (pork belly). We set up makeshift grills using charcoal briquettes and mesh panels. Immediately, each person of the group assumed a role: meat griller, veggie cutter, sauce spooner, plate passer-outer, and, most importantly, beer/soju pourer. We ate until we couldn't eat anymore. Then, out of nowhere, someone started passing out sparklers. We continued to drink and play with fireworks in the crisp, salty sea air under a full moon. Haengnam Coastal Walking Path: The final activity on our itinerary, which happened to be the highlight of the trip, was the coastal walk on the Haengnam Walking Path (directions). 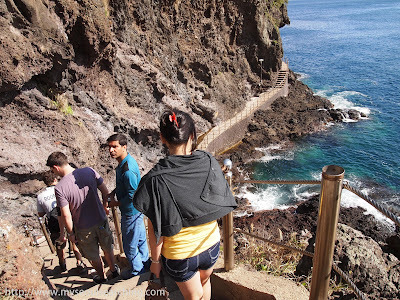 This path stretched across an incredibly scenic portion of the island's coast around impressive rock formations, over eye-catching (but slightly terrifying) bridges, and through a lush forest. We crossed paths with fishermen donned in wetsuits and knife-toting grandmothers, ready to shuck and slice the day's catch. A few people in the group even went bridge-jumping into the crystal clear blue waters. During some parts, I was certain that I was going to be blown off the bridges into the waves, left in Ulleungdo forever, but when we least expected it, we reemerged into the port just as our ferry docked. The three hour walk was the perfect way to end our stay on the island. 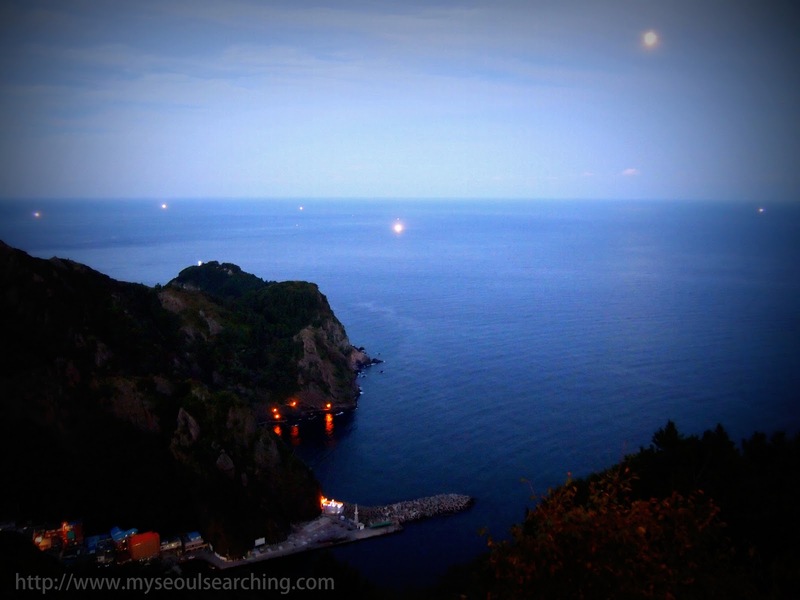 I felt incredibly relaxed after my stay on Ulleungdo. The peaceful blue waves, the revitalizing hiking, and the breathtaking sunsets satisfied my desire to get in touch with nature, something the country girl inside of me had been needing for a while. 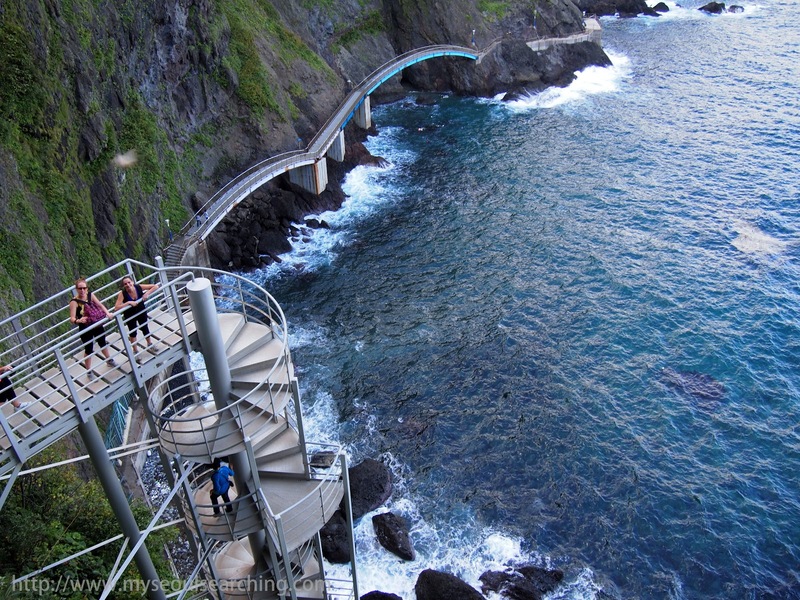 Sure, there may not have been any historical landmarks or famous dining establishments to check out, but Ulleungdo offered up something even more special: an opportunity to experience authentic Korean island life and a chance to get away from it all. 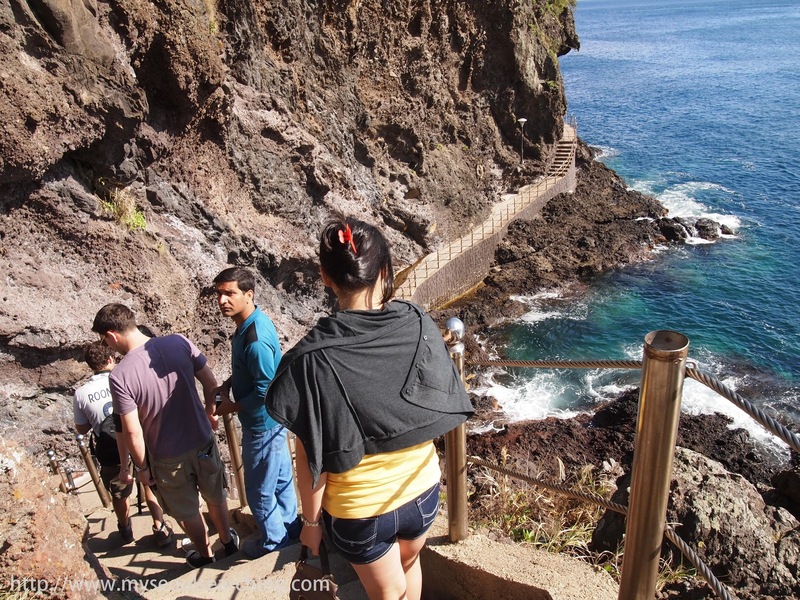 Tip: Because Ulleungdo does not see many foreigner tourists, little English is spoken on the island. It is advised to go with a group or book transportation and accommodation in advance. 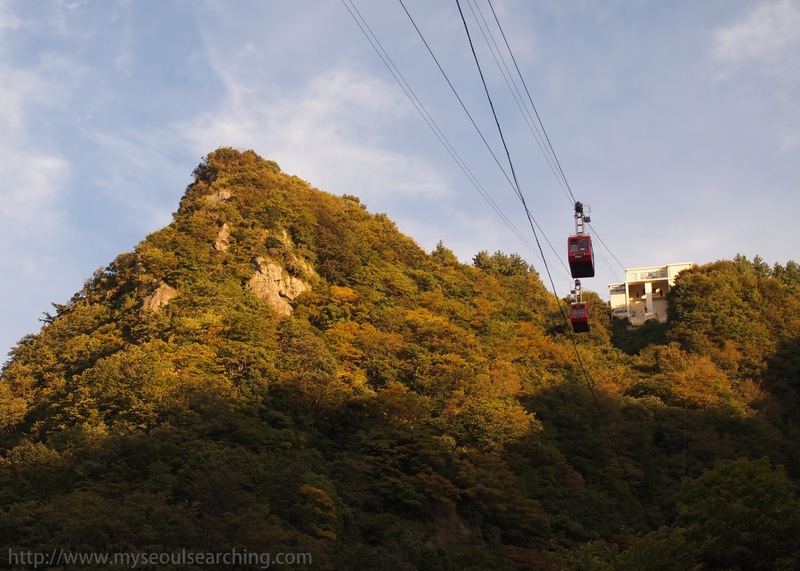 In addition to WinK, Adventure Korea also offers budget friendly English tours to Ullengdo. See their website for tour schedules. Tip: Vendors sell chewable tablets and drinks to prevent seasickness at the ferry ports for less than 1,000 won. It is recommended that you take it 30 minutes before departure. This is a beautiful island and I have visited before west coast tour with one of my clients. Being a tourist guide I want to give you some tips to traveling Ulleung Island. 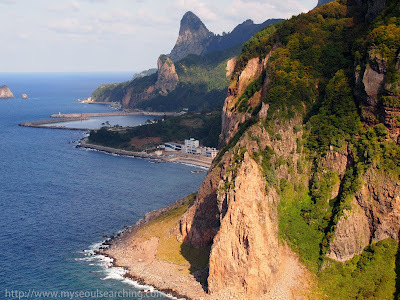 Ulleungdo Island and Dokdo were islands created by volcanic. The steep cliffs and rough rocks stick out majestically among the calm of the East Sea. Dokdo is 87.4 kilometers away from Ulleungdo. Ferries departing from Ulleungdo Island to Dokdo leave from Jeodonghang Port. These passenger ship schedules are subject to change according to season and weather conditions, so be sure to check the schedule before departure.